Dereference a TreeModel::iterator to get the Row. Use operator or set_value() and get_value() to access the values in the columns of this row. If the model contains a hierarchy of rows (such as Gtk::TreeStore), then you can access the child rows with children(). 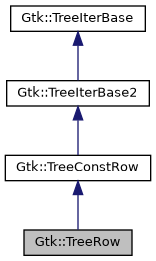 You can use a const TreeModel::Row& for any parameter that takes a const TreeModel::iterator&. This typedef is just to make it more obvious that our operator const void* should be used like operator bool(). Use the explicit operator bool() instead. This returns an STL-like container API, for iterating over the rows. See also Gtk::TreeModel::children() for the top-level children. Gets the value of this column of this row. This is a templated method, so the compiler will not allow you to provide an inappropriate type of data for the model column. Use get_value(const TreeModelColumn<>& column) unless you do not know the column type at compile-time. If the data output argument is of an inappropriate C++ type then this might fail at runtime. column The number of the column whose value you want to query. [out] data An output argument which will contain the value of this column of this row. Discover whether this is a valid row. Use this to set and get the value of this column of this row. This is just a more convenient syntax that does the same thing as set_value() and get_value(). Gets an iterator to the parent row of this row. An iterator to the parent row. Sets the value of this column of this row. data The new value to use for this column of this row. Use set_value(const TreeModelColumn<>& column, const ColumnType& data) unless you do not know the column type at compile-time. If the data is of an inappropriate C++ type then this might fail at runtime. column The number of the column whose value you want to change.